During the time Jesus preached the gospel, he didn’t know about the existence of the Eighth Sphere (plane -2), instead he had the ancient concept he learned about Hell or Sheol in the religious teachings of Judaism. In spite of the limited information he had (only based on the scriptures) Jesus had a very important role in History. In this present time, it’s important to reveal once and for all that the biblical Hell does not exist in the way that all religions have taught us. 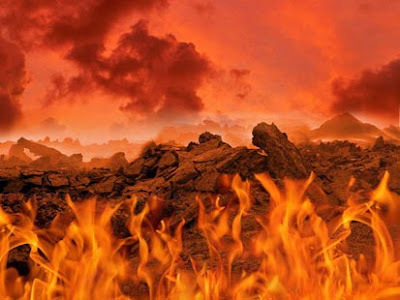 Obviously, many people will not receive this new paradigm and they will keep thinking that an eternal fire will consume the wicked in the end of times, but those who will use common sense will realize that God would be so cruel in that case and Jesus was human after all and as a Master of Light of the plane 4 in that time he was also fallible. Master Jesus: Joyful to be again with you. I am Yeshua ben Yosef. For you, I am Master Jesus. Interlocutor: I welcome you, Master, and I’m listening to your message. Master Jesus: I came specifically to clarify some needed points about vibrational levels. There are six positive planes of spiritual vibration, starting with level 1, which is the one of incarnated beings, that is to say, the physical level. Follow spiritual levels 2 and 3, which are planes of Error, plane 4, which is a master's level, and plane 5, where spirits dwell of most Light. Plane 6 belongs to the angelical world. This plane, in fact, is not above plane 5, but giving you an earthly example: a dolphin and an elephant coexist in the same plane, but in different habitats. In addition, there are two negative planes: level - 1, that is a vibration where the spirit is completely isolated and level - 2, where each spirit shares the pain of all the other spirits who live in that plane. Besides, there is a vibrational level 7, inhabited by Divine Energies and vibrational level 8, of the Elohim or minor gods. While still alive, being incarnated, almost two thousand years ago, the Divine Energy that communicated to me with the Father was “The Christ”, at that time he was the Solar Logos. There is a lot of misinformation when it’s said that The Christ was Planetary Logos, because that position was held then by Eloah Jehovah. The Christ was Solar Logos and was then in charge of the entire planetary system. The Dimensional Logos was the Divine Energy Abraxas. The Eloah Jehovah, whose level of vibration was 8, sent part of him to plane 4 in order to facilitate his communication with incarnated beings. That was how he could communicate telepathically with Moses. Unfortunately, human beings had no other form of spiritual communication and confused this Eloah with the Father. To make things worse, Jehovah had very many conduct deviations incurring in despotic attitudes with incarnated beings, sometimes touching the limits of cruelty. Interlocutor: Was he lowered from level? Master Jesus: No, in the spiritual planes there is nobody in charge to raise or lower level of vibration to those who behaved well or badly. The entities themselves can ascend or descend, according to their behavior, because that behavior makes them to become subtler or denser. Further, in the case of an Eloah, they belong to plane 8 and cannot lower from level. But when not helping humanity to raise spiritually in two thousand years, this single fact is already a backward in an entity such as Jehovah... Or not? Interlocutor: Master... What happened when you disincarnated? Master Jesus: When I disincarnated I asked the Father with all my love to allow me to descend to the Eighth sphere to share the pain of the entities that inhabited that level and alleviate their suffering. Immediately after, I went to level 4 of Masters and I was appointed as a new Planetary Logos. One thousand years after disincarnating, I had the joy to ascend to level 5, and I was appointed Solar Logos. In turn, the Divine Energy, the Christ, became the new Dimensional Logos instead of Abraxas. Interlocutor: What is the role of a Dimensional Logos? Interlocutor: Master, Why is it said that you descended to hell when disincarnating? Master Jesus: It said that I descended to that invented hell because, as I said before, I requested to lower down to the Eighth Sphere, vibration -2. This plane is the densest of the Creation, where spirits who have extreme cruelty dwell. There, they can feel the pain of other spirits where each one lives it like his own. It’s a state of great oppression, until each entity understands that all suffer equally and learn to share pain. Know that no spirit is equal to another one. Because of free will given by the Father, each spirit may choose to serve, love, share or live for their fellow man. He can also choose to submit, dominate, absorb, confuse, hurt or live on other spirits. Anyone who lives on the other, who submits to another, who submerges in permanent mistakes, error, evil, can go down to the Eighth Sphere. But there is also a mistake on this. It was thought that the Eighth Sphere was a very negative dimensional energy center that the cruel spirit, who came there, disintegrated itself with the cosmic energy. Interlocutor: So... Is not the Eighth Sphere Area the end of the black magician? Master Jesus: It’s the transmutation of the black magician. No destruction or eternal fire. When I asked to go to the Eighth sphere it was because I needed to live experiences of those who suffered. Interlocutor: I understand… What was your activity there, Master? Master Jesus: I calmed sorrows, closed wounds, I gave consolation, but they were so blind –not from sight, but spiritually – that they did not listen or became aware of what it was transmitted. I tempted myself and I tried to provide those pearls, contradicting from what I had said to my followers, when seeing so much pain. Later I reflected and I thought that only the Divine Mercy of the Father might induce them to rise slowly and stop squirming in agony. Interlocutor: It’s crystal clear, Master. Master Jesus: Another misconception is the belief that the higher the level of vibration, the lesser the suffering. It’s quite the opposite. But obviously, in the Light planes we don’t suffer for our mistakes, but for mistakes of others, for wrong doings of beings that are in dense vibrations, trying to manipulate other beings of their same vibration for personal gain. At level 5 of spiritual vibration, we have much task. We live to serve with many other entities, who feel that the goal is to share, who enjoy seeing others happy, who enjoy their happiness, but not all is joy. We also suffer the pain of those who are dominated by ego. We suffer for those who only think about dominating. We know that suffering is not forever. It was already dictated to this vessel that it will be a great communion with the Father, without losing our individuality, to be able to enjoy in Him, in the Father. And it will be. I leave you and I am with you, always. Johnakan: I’m Johnakan Ur-el. I confirm the words of my beloved Master and add: When we suffer at the Light planes we suffer by empathy. We surround with our Ray the spirit of Error who is in crisis and try to console him. We don’t always succeed, as there are spirits who rebel by arrogance and don’t allow to be helped. The same happens on the physical plane. There are many people who believe to have the absolute truth and don’t listen to any guidance. Others have malice and, guided by ego, make a destructive criticism against those who only seek to serve. There is still much to do, but not just passing the word, but through work. Because the word without action is sterile, it's like the flower without scent. It’s necessary that everything that is planned is carried out later. Nothing can be achieved without sacrifice, but we know that the path of good is a path with thorns. Never evade a commitment; never cease to respond to a request for help, nor ignore the given word, because honor is fundamental. Don’t ever cease to get knowledge, because the more knowledge you have, the more you can transmit to others. And never hold back what you know, because knowledge that is not given rot within the stingy person. Sharing is also Service. With all my love saying goodbye to you, Johnakan Ur-El. Interlocutor: What did it happen to the spirit of Jesus when he disembodied? Johnakan Ur-El: Once disincarnated that is to say, being already a 100% spirit, he took advantage to go to the Eighth Sphere. One of his missions was to feel, to perceive the feelings of the spirits that had lowered down to that place. It is something similar as if at this time your physical part, your 10% meets with a crowd and then you open up your arms trying to feel everybody, to feel all of them, as if the tips of your fingers could feel the thoughts of everyone. Obviously I am speaking in a metaphoric way. When Jesus lowered to the Eighth Sphere, it was like he opened up his conceptual arms, that is to say all his spiritual concept, to feel and try to talk, but it was a dialogue of the deaf. Translating the concepts to words, forcing the interpretation because in fact the spiritual concepts are untranslatable. He told them: - "What is happening with you? ", And the answer was something similar as if somebody took you of the lapel and answered "Help me!" -But tell me what is happening to you!, Jesus insisted. From the other side they didn't respond the reasons, because they wanted a solution at once. Then Jesus went to another spirit and he asked the same question: - Tell me what is happening to you shares your pain with me! -, and the answer was always the same: --“I don’t want to share anything; I want you to alleviate me now!” It was a "dialogue of the deaf." If there was some teaching that Jesus learnt from the eighth Sphere when he lowered there, it was the tremendous, monumental Ego that there is in that plane due to the same suffering. The spirits don't have ears, or eyes, or mouth, but it was as if they had them. For that reason I say that it was a dialogue of the deaf, of blind and of mute. Practically nobody listens to the other there, and all of them are plunged into their own pain. A similar example to what happens to the spirits in the Eighth Sphere, you can see it in the movies where people try to escape when there is a bombardment, they run away side crashing with each other. That is to say, not all of them go in the same direction like those giant ants called “Marabunta” that you will surely have seen in many movies. Interlocutor: Yes, I have seen them. Johnakan Ur-El: And in the physical plane, when there is an earthquake, a bombardment or some catastrophe, the human beings escape everywhere. Well, imagine that increased to the umpteenth power and you will have a view of what the Eighth Sphere is. Interlocutor: I understood perfectly. How is the vessel to continue? Johnakan Ur-El: He is very destabilized. Interlocutor: Then I will ask the rest of the questions in the next session. Johnakan Ur-El: I leave all my Light to you. THE EXPERIENCE OF RADAEL IN THE EIGHTH SPHERE. Interlocutor: Can a 10% embodied go to the Eighth Sphere? Radael: No, not at all. Interlocutor: Well, when was the first time you were, or rather that we were in the Eighth Sphere? Radael: The first time was when we disembodied as Nero. Interlocutor: I would like you to remind me the experience. Radael: I visualize at a conceptual level a lot of beings. Interlocutor: I’d like you to begin from the moment in which we both committed suicide as Nero. Radael: I feel very uncomfortable remembering those episodes. Interlocutor: But how can that be if that has been already overcome with Psychoauditing? Radael: What happens is that reviving the Eighth Sphere is not so simple, at this time I am reviving the suffering of thousands and thousands of beings. Interlocutor: Okay, Radael, but I wanted to start from the moment in which we committed suicide. The dagger penetrating our heart. Was there some light? Did we lower down immediately? How was the process? Radael: In that moment I visualized everything black, I lost the notion of the senses, of all the senses, and I felt a tremendous lucidity, a mental clarity and a tranquility it is as if I had escaped from something, it was as if that physical death put me free from something horrendous and I felt like a kind of ecstasy. Besides, my concept is developed in an incommensurable way and all that I believed I had lost, the taste, the tact, the smell, the sight and the hearing returned in a superlative way, and in that moment I felt an enjoyment so, but so big, until suddenly my concept begins to perceive pain. For the first time I will explain how the spiritual pain is. The spiritual pain is an inexpressible pain that writhes you that causes you anguish, sorrow, grief, powerlessness and an enormous feeling to disappear from there. Suddenly I perceived other, and another, and other beings that suffer and they appear thousands, all spirits that suffer, and a kind of spider web of pain was formed. The Master Johnakan explained it once that if you in the physical plane have a very painful toothache your escape could be if you pass out, but in the spiritual plane, fainting doesn't exist because we are not physical. Then imagine yourself feeling thousands, millions of toothaches, in a single conceptual organism. In that moment, no matter how much they contact you hypothetically with their virtual antennas, you don't want to know anything about the others or anybody because you are, metaphorically speaking “rolled up” and in that moment you don't want anything, and you ask God, and you cry unto God, and you beg unto God, and you curse him in that moment you hate God, because you want to get out of that state. Interlocutor: In that moment Did we understand the reason we were in the Eighth Sphere suffering? Radael: No, because my pain surpassed my conceptual thought, it surpassed me; it erased it in that moment, until the transformation came. Interlocutor: But did we know that we were in the Eighth Sphere? Radael: Yes, I knew it conceptually because I visualized the place. Besides, I was already informed. Interlocutor: Did we feel when we passed along the plane -1, the plane of Solitude descending? Radael: If I had to give you an example it is like a super elevator that descends floors like shadows and you don't realize what is happening. What you want is to close your curtain in order to not feel or hear anything. Interlocutor: Do all the spirits that are in the Eighth Sphere perceive the same suffering or each one of them perceives it according to their hostile acts? Radael: Each one perceives it in its own measure. What happens is that not everyone has the same resistance capacity. It is something aberrant. Besides, we don't visualize it because we don't have eyes, we conceptualize laments, howls, up, below, everywhere, it is something that trespasses you, until a moment comes in which you get used to the pain, as you get used to a buzzing, as you get used to a flapping, and it is sometimes easier to get used to an intense noise than to a small noise. In the physical plane the proof of what I tell you exists. If you suddenly are closer to a place where there is an electric saw working and if you have a tremendous sleepiness, you can fall asleep even with the buzzing that the saw produces. But possibly at night if you lay to sleep and if there is faucet that drips, the noise that takes place might prevent you to sleep. And how can it be that in the afternoon you fell asleep with the buzzing of an electric saw? Here the same thing happens, one gets used to the big pains, to the big griefs. And it is when you get used to the pain, you stop thinking a little bit, only a little bit, in your person and you begin to see the others, you perceive it and you notice their pain, and in the smallest moment you feel sorrow of what is happening to the others you automatically raise of level because you stop thinking about yourself and you start thinking about the others. Interlocutor: And did this happen in this way? Interlocutor: How long were we in the Eighth Sphere? Radael: I don’ have the exact notion of time, but they could have been several months because they seemed to me as an eternity. Interlocutor: How did we realize that thinking of the others one could ascend of plane? Or didn't we know it? Radael: I didn’t realized it, it just happened. When I got used to the pain I began to perceive the other souls, and I tried to find out what was happening to them, why they were complaining, and I felt a kind of anguish for the others, and suddenly I saw myself in a higher plane, the plane 2. Interlocutor: With whom were we in the Eighth Sphere? I mean to somebody well-known. Radael: There were many evil characters, chiefs of tribes that slaughtered many people. Radael: Among them was Moses, if it was not said previously, it is a scoop. Interlocutor: Obviously he got out of there. Interlocutor: Are there spirits that are a lot of time in the Eighth Sphere, for example centuries? Radael: They can be as long as they don't acknowledge the pain of the others. I want to reiterate what Johnakan already said in an opportunity that the biblical hell of eternal punishment does not exist, it’s a fantasy. Interlocutor: That’s clear. How did we live in the Eighth Sphere with the hostile acts we committed against many people when we embodied as Nero? Radael: At the beginning, with a tremendous pain I felt I didn't think about them, I only perceived the pain of millions of beings and I was not interested in Nero, or Rome, or anything at all, the only thing I was interested in was my spiritual being and I writhed looking for the way to leave that place and the more I tried to get out, the more I sank, as if it were a humongous swamp. Interlocutor: Before embodying as Nero, In which spiritual plane were we? Perhaps it was said but I don't remember at this time. Radael: We were in the plane 4, afterwards we lowered down. We have being in all the planes. Interlocutor: Were we in the plane 5? Radael: Yes, when we were created by Elohim. Interlocutor: You are right; I had forgotten that detail, Ron explained to me some years ago in a session. Is there something more to remember from this fall to the Eighth Sphere? Radael: I am draining vastly the forces of this vessel, to the point that he seems as if he were doped. Interlocutor: Well, I will hurry the session. Do we go up to the plane 2, and what happened? Radael: I didn't feel compatible with the plane 2 because I saw the wickedness of many spirits, and with all that I had suffered, I didn't want to know anything about them. I Quickly ascended to the plane 3. Interlocutor: And we embodied then? Radael: Correct. The vessel is with so little energy that he babbles. Interlocutor: Do we leave it for the next session? Interlocutor: Could it be interesting another incarnation where we descended to the Eighth Sphere again? Radael: Yes, it could be very interesting. Interlocutor: Then, I’ll summon you for the next session. Different religions saw in their prophets genuine Divine-human expression, but unlike Judaism and Islam, Christianity raises Jesus to partner with Divinity, with the Father and the Holy Spirit (Louis Fabre). H is the reincarnation of Nero the Roman Emperor. This entry was posted at Tuesday, February 16, 2010 and is filed under Biblical mysteries . You can follow any responses to this entry through the .